First, we had to struggle out of bed and turn the lights off before calling it a day; next came the two-way switches with one main switch and one next to your bed, so you could just lean and turn it off; and then came the motion sensors where lights turn off automatically when they don’t sense motion and turn on when they do. Technology has entered our homes and our lives on tiptoe, and we have welcomed it with open arms and a smile. From fashion to food, every industry has benefited from the convenience of technology, and real estate is no exception. Let’s take a look at the various technological advances in the real estate industry and the effects they have on the consumers and developers. Buying a property is much easier now with the virtual real estate market created by the Internet. You can now investigate and gather information about a property in ECR sitting in the comfort of your home in the US. With groundbreaking technology like digital paper and super-fast internet available at your fingertips, you can easily check for property listings, locations types and developer reviews with the click of a button. You can now experience living in your new property before moving in with the help of Virtual Reality (VR). This cutting-edge technology is also used by real estate developers to advertise a brand new property to potential home buyers. In spite of financial constraints, there is an increase in the commercial use of VR across the country which proves that this trend is here to stay. Building Information Modeling (BIM) is an innovative technology used by property developers to showcase soon-to-be constructed projects to potential home buyers. With the use of this technology, architects can project a 3D design of the development. This gives potential investors a closer insight into the physical dimensions of the building with an emphasis on the strength, lighting and skeletal structure of the property. This, in turn, leads to an increase in property sales due to the better understanding of the development provided to the home buyers. Social Media has a huge influence on consumers from different walks of life. From checking out authentic reviews of new projects to joining groups and having a detailed discussion of the amenities and facilities provided by well-established property developers, the world is your oyster! Apart from benefiting the consumers, Social Media is also an excellent platform for real estate developers to advertise their properties and reach out to their target audience. When time is premium, and life hangs in the balance, technology comes to the rescue with a built-in work-life balance. There are smart mirrors that update you about your schedule as you get ready for work. Additionally, home automation systems give residents control over everything, from temperature settings to entertainment systems. To add to that, Wi-Fi enabled cameras rule the roost in today’s advanced homes with hi-tech features. These are features that will give you comfort and ease of living, and that too at the touch of a button, or better still, in a single click. For more trendy home appliances, check out our blog on the top 7 gadgets to keep your home safe. 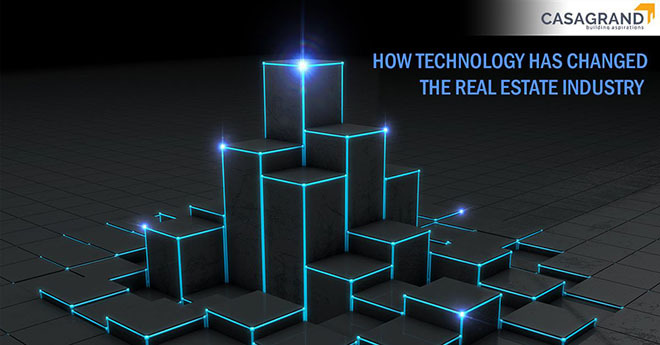 To sum it up, it is safe to say that technology has created a huge positive impact on the real estate industry. These technological advances have affected both the property developers and potential home buyers equally, and these benefits are only going to multiply! If you are looking for a new property, read our extensive guide to make sure the property you buy is legally clear and useful Gruhapravesam tips for your new home. Make sure you head out to Casagrand today and find a house you can call home!